Incidence of thoracic aortic aneurysm as reported by Minnesota is 5.9 new aneurysms/100,000 person-years with median ages of 65 years for men and 77 years for women and a distribution of aortic segments as follows: the ascending aorta was involved in 51%, arch in 11% and the descending thoracic aorta in 38%. Prevalence of thoracic aortic aneurysm is around 4.2% in general population. Aortic aneurysm leading to aortic regurgitation is reported in 60% of these cases. The pathogenesis of aortic aneurysm has not been established fully, but it is believed to be multifactorial and include atherosclerosis, increased tissue protease activity, antiprotease deficiency, mechanical factors, inflammatory disorders, infection and genetic collagen defects such as Marfan syndrome. The etiology of thoracic aortic aneurysm is most often aortic dissection in 53%, arteriosclerosis in 29%, aortitis in 8%, cystic medial necrosis in 6% and syphilis in 4%. We describe an unusual case of cystic medial degeneration leading to aortic aneurysm with aortic regurgitation in a 42-year-old male patient. A previously healthy 42-year-old man presented to our hospital with the complaints of severe chest pain. On examination, diastolic murmur was discovered, which was maximum at the aortic region with vigorous pulsation of the suprasternal notch. There was no significant past or family history of similar complain. Echocardiography computed tomography and magnetic resonance imaging were carried out which revealed a fusiform aneurysm of the ascending aorta associated with aortic regurgitation [Figure 1]. There was no evidence of any dissection of the aortic wall. Modified Bentall's procedure was done repairing the aortic aneurysm in combination with the aortic valve. 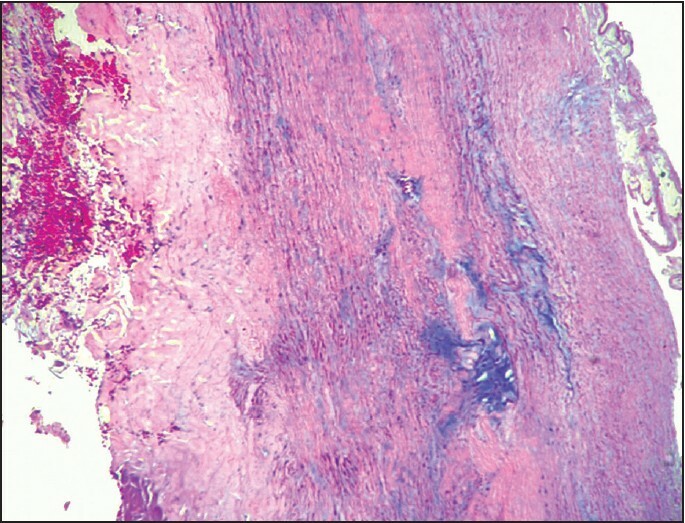 Specimen of ascending aorta along with aortic valve was sent for histopathology. On gross examination aorta measured 8 cm in length and was fusiform in appearance with a maximum diameter of 2.5 cm. The aneurysm was involving the aortic valve, which measured 3 cm in diameter. 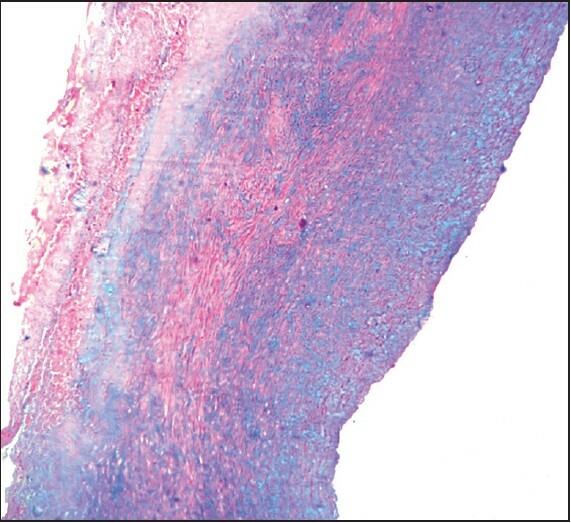 Histological examination of the sections from ascending aorta showed thickening of intima and media along with deposition of basophilic ground substance in the media [Figure 2]. Elastic fibers of aorta were fragmented over large areas and there was focal disarrangement of smooth muscle fibers. The basophilic ground substance was positive with alcian blue at pH 2.5 [Figure 3] thus revealing accumulation of acidic mucopolysaccharides between the disrupted elastic lamellae of the media. Tunica adventitia was unremarkable. Thus, a final diagnosis of cystic medial degeneration leading to aortic aneurysm and regurgitation was made. Cystic medial necrosis in aortic dissection was initially described by Babes and Mironescu, but attracted little interest until, Gsell and Erdheim proposed the concept of idiopathic cystic medial necrosis. It was reported to be associated with aortic aneurysm, aortic dissection and rupture, and Marfan's syndrome. The aortic aneurysm caused by cystic medial degeneration is usually limited to ascending aorta. No definite reason or genesis has been attributed to this site preference. However, a few reasons suggested are that there is difference in composition between the ascending and descending aorta, which is responsible for difference in the etiology of aneurysms that develop in these areas. Ascending aorta has a greater concentration of elastic fibers and is more compliant than the descending aorta. Thus, the majority of ascending aortic aneurysms is associated with degenerative changes in the elastic media. In contrast, the majority of descending aortic aneurysms is associated with atherosclerosis. The resulting aneurysm involves the entire ascending aorta, especially the sinuses of valsalva. Dilatation in the region of the sinuses of valsalva produces gross aortic insufficiency. Due to this aortic insufficiency, left ventricular end-diastolic pressure is increased and it compromises coronary perfusion pressure gradients, which lead to severe chest pain as seen in our case. Prevalence of cystic medial degeneration is estimated to be 6% in patients with thoracic aortic aneurysm. Incidence of cystic medial degeneration increases progressively with age and reaches up to 60% and 64% in seventh and eighth decade, respectively. This condition involves mainly two populations one of old age with no special history and other is postadolescent patients suffering from Marfan's disease. Our patient on the contrary was relatively young, of only 42 years of age and was not suffering from Marfan's disease. The two clearest clinical associations with cystic medial degeneration of aorta are hypertension and genetic inferiority of the aortic media as in case of Marfan's syndrome. Ageing in the sense of accumulated physiological stresses seems to be another factor. Pathogenesis of these aortopathies has now been considered more as a consequence of aortic wall weakness. However, none of these factors were present in our patient as he was not having any previous complains of hypertension. Also any of the signs and symptoms of Marfan's syndrome like tall-thin build, arachnodactyly, flexible joints, scoliosis, pectus excavatum, pectus carinatum, dislocation of lens, early glaucoma, spontaneous pneumothorax and dural ectasia were not present in our patient at the time of admission and he didn't had past history of any of these complaints, which ruled out the possibility of Marfan's syndrome clinically. Thus, the case was diagnosed as idiopathic cystic medial degeneration. The exact incidence of this is still unknown. Histological changes reported are loss of elastin and collagen fibers, which is the main cause of the disease along with accumulation of acidic mucopolysaccharides; also known as mucoid or myxoid degeneration. The etiology of this entity is unclear. The course of the disease is often fatal due to spontaneous rupture of aorta. Akin I, Kische S, Rehders TC, Nienaber CA, Rauchhaus M, Ince H. Endovascular repair of thoracic aortic aneurysm. Arch Med Sci 2010;6:646-52. Booher AM, Eagle KA. Diagnosis and management issues in thoracic aortic aneurysm. Am Heart J 2011;162:38-46. Isselbacher EM. Thoracic and abdominal aortic aneurysms. Circulation 2005;111:816-28. Yuan SM, Jing H. Cystic medial necrosis: pathological findings and clinical implications. Rev Bras Cir Cardiovasc 2011;26:107-15. Crawford ES, Svensson LG, Coselli JS, Safi HJ, Hess KR. Surgical treatment of aneurysm and/or dissection of the ascending aorta, transverse aortic arch, and ascending aorta and transverse aortic arch. Factors influencing survival in 717 patients. J Thorac Cardiovasc Surg 1989;98:659-73. Weldon CS, Ferguson TB, Ludbrook PA, McKnight RC. 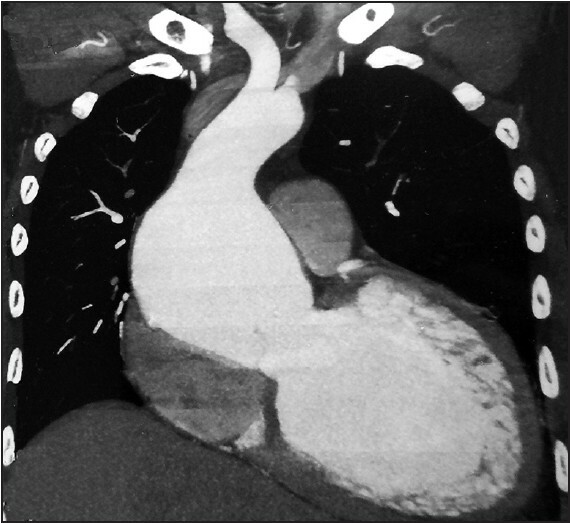 A new operation for far-advanced cystic medial necrosis of the aortic root. Ann Thorac Surg 1977;23:499-506. Carlson RG, Lillehei CW, Edwards JE. Cystic medial necrosis of the ascending aorta in relation to age and hypertension. Am J Cardiol 1970;25:411-5. Loire R, Man J. Aortic insufficiency and degenerative aortic disease. Anatomic study and etiology. Ann Cardiol Angeiol (Paris) 1990;39:327-31. Mckusick VA, Logue RB, Bahnson HT. Association of aortic valvular disease and cystic medial necrosis of the ascending aorta; report of four instances. Circulation 1957;16:188-94. Gary T, Seinost G, Hafner F, Gorkiewicz G, Brodmann M. Cystic medial necrosis Erdheim Gsell as a rare reason for spontaneous rupture of the ascending aorta. Vasa 2011;40:147-9.